If you’ve had an experience trying to call the IRS, it’s likely you already know better than to try to call them on your own. It’s almost certain that if you try calling, you’ll be met with extremely long wait times, a confusing automated system, and perhaps even a “courtesy disconnect” where they basically hang up on you before you can ever talk to someone. If you are lucky enough to talk to someone, they’ll likely try to divert you to the IRS.gov to get the answer that you’re looking for. 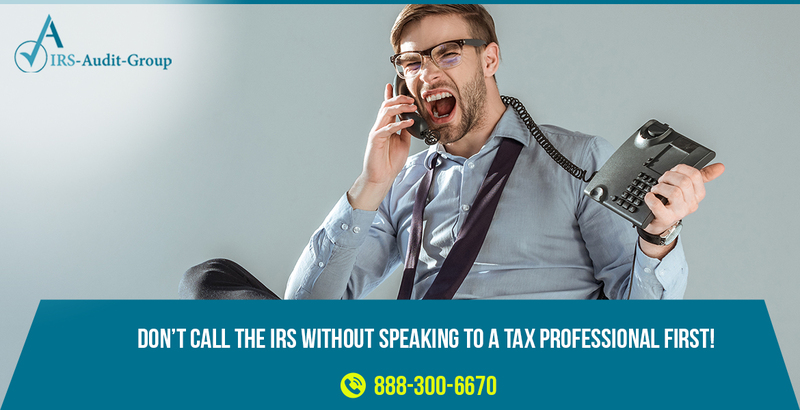 Instead of calling the IRS on your own, you can have our tax professionals at IRS Audit Group call on your behalf. Authorizing a tax professional to represent you on your behalf is simple, easy, and affordable. Having one of our professionals call the IRS on your behalf is highly recommended, especially if it is a more complicated issue that you’re calling about. If you’ve received any type of notice from the IRS, for example, you do not want to stand up to the IRS on your own. Many people will often immediately call the IRS after receiving any type of letter, which typically only makes the problem worse. Our team of tax attorneys, CPAs, and enrolled agents have extensive experience in dealing with the IRS and know how to talk to IRS officials to help our clients reach a successful resolution. Navigating through an issue with the IRS can be extremely tricky, time-consuming, and potentially even costly. Let our team at IRS Audit Group guide you through any experience with the IRS. Give us a call today at 888-300-6670 if you have any questions about a notice you’ve received, tax law questions, pending audits, or any other tax-related issue. Now, everything is digital. Automated. Phone calls send you to a machine, or refer you to a website you barely have time to write down before the automated voice is disconnecting you. Attempting to contact the IRS is no different. You still have the likelihood of calling them only to be dismissed, and emails can so easily get lost in traffic. Overall, trying to contact the IRS is difficult, harder than it should have to be. When they hear the average citizens voice, they’re quick to dismiss, which is why having a set of reliable income tax professionals is so important in a quest to contact the IRS. A risk anyone takes opening themselves up to strangers is the possibility of judgement and suspicion. If you are to call the IRS, especially on account of already piquing their interest due to an inconsistency in your tax filing, they might even get you in more of a cram than you already may have found yourself in. Leave it to the tax professionals. We know how to handle these sorts of situations. It’s our job, and to try and contact the IRS on your own will only make issues more complicated than they have to be. The IRS Audit Group is full of passionate representatives ready to work as your personalized tax representatives. We will fight for you. Having the advantage of a real tax professional service is one step in the right direction to resolving whatever IRS or tax issue you may be experiencing. Finding great help these days can be difficult, but the IRS Audit Group will only work in your favor. So, if ever you’re finding yourself looking up a great group of tax professionals near me, be sure to check out The IRS Audit Group in California. It’s always nice to have someone you can count on. Nobody likes a flake. And while the IRS can be a tricky bunch to grab ahold of and contact, our services make it easy to settle any pending issues or conflicts you may have with the IRS. We are a reliable service full of hardworking individuals working to do what’s best, and what’s right for YOU. There is no pride in mediocracy, and we strive to do be the best tax professionals and offer the best tax professional services there is. You can count on us no matter what the issue is. We don’t judge and we don’t hesitate. We are not afraid to be confrontational. We will fight the matter with an assertive force and ensure your conflicts with the IRS are resolved civilly.